Last year’s Galaxy Note 8 was a totally solid phone, but it wasn’t very exciting. With a screen that was the same size as what you get on a Galaxy S8+ or S9+, and a battery that was actually smaller, it felt like Samsung played it safe. But on the new Galaxy Note 9, it seems Samsung is back to its old, component-cramming ways, and despite looking basically the same as last year’s handset, the Note 9 is packing a lot more muscle inside, which is exactly what I’m looking for in Samsung’s high-end plus-sized phone. At least in the U.S., the Note 9 will be available in four colors: black, orange, a deep ocean blue version pictured here, and a lavender purple hue seen below. Starting with its screen, the Note 9's QHD AMOLED display remains the best in the business and has been up-sized slightly from 6.3 to 6.4-inches. Meanwhile, on the inside, its battery has gotten a significant bump up to 4,000 mAh, which is more than 20-percent larger than the Note 8's 3,300 mAh power pack. But the spec juicing doesn’t stop there, because Samsung has also doubled the Note 9's base storage from 64GB to 128GB, while retaining a healthy 6GB of RAM, and the phone’s handy microSD card slot. And in move that’s typically reserved exclusively its Asia-only Galaxy phone variants, Samsung is making a super premium version of the Note 9 for the U.S. with 8GB of RAM and a massive 512GB of storage. From there, you’re just a 512GB microSD card away from having a 1TB phone. To add a little spice, the blue Note 9's S-Pen is bright yellow. And to keep all the performance from the Note 9's Snapdragon 845 processor running at peak speeds even during prolonged usage, Samsung claims to have bulked up the Note 9's cooling with a new carbon fiber interface to help improve thermal conductivity, and a 335 square-millimeter heat spreader that’s more than three times bigger than the ones in a Galaxy S9+ or Galaxy Note 8. Even the Note 9's S-Pen has been enhanaced with a built-in supercapcitor that lets the stylus soak up 30 minutes of standby time in just 30 seconds. But that’s not all, because the S-Pen now has built in Bluetooth LE too, so you can use the stylus as a tiny little remote. It seems Samsung is really paying attention to little details, because by default, each Note 9's S-Pen is set to write in the same color as the stylus. Initially, the S-Pen remote feature will be restricted to first-party Samsung apps like the music player or camera app, so you can open the camera by long-pressing the S-Pen’s button, press twice to switch between front and rear cameras, or just tap it once to snap a pic. Yet Samsung plans to build out the S-Pen’s compatibility, and is also providing an SDK for the S-Pen’s remote functions, so later on, developers can add similar features to third-party apps. Sadly, the Note 9's camera is physically the same as what you get on the Galaxy S9+, with an 8 megapixel camera up front, dual 12-MP cameras in back, variable apertures that can switch between f/1.5 and f/2.4, and a 2x zoom lens on the secondary cam. It’s a bit hard to see the little fork and knife icon that lets you know it’s working, but thanks the Samsung’s scene optimizer, the Note 9 does know that macarons are indeed a type of food. However, Samsung did add a little AI smarts to the Note 9's camera app, so now it can detect 20 different objects and use that info to automatically tweak the phone’s camera settings for the best results. Yet since we’ve seen companies like Huawei, LG, and others do the same on phones as far back as late 2017, Samsung’s scene optimizer feature doesn’t really feel very innovative. What does feel innovative is the Note 9's flaw detection feature that can detect when a picture is blurry, backlit or messed up because someone blinked or smudged the lens. It causes the camera to throw up a warning saying you might want to retake the shot. Don’t worry, Samsung hasn’t ditched the headphone jack yet. And for those who want to put all those specs to use in a different sort of way, the Note 9 also includes an improved Dex mode that lets you hook the phone up to an external display and use it like a mini desktop. The one caveat is that you will need one of Samsung’s $50 adapters to make that happen, because a regular USB-C to HDMI dongle won’t trigger the phone into activating Dex mode. I still wish Samsung had done something more with the Note 9's design, because even though I do like that new deep blue and yellow color scheme, flashy colors only go so far. Unfortunately, Samsung hasn’t gotten rid of it’s Bixby button. Oh, and about all those Fortnite on Android rumors? Well it seems Samsung is giving the Note 9 the first crack at Epic’s Fortnite beta by pre-installing the game out of the box. However, the Note 9 won’t be the only phone capable of dropping in, because starting today, the Galaxy Note 8, the Galaxy Tab S4, and every other Galaxy S phone going back to the Galaxy S7 will also be able to download Fortnite from Samsung’s Game Launcher app. Epic has elected not to put its game on the Google Play Store, so its appearance on Samsung’s Game Launcher will make it one of the easiest methods for sideloading the game onto an Android phone. But in the end, I still have one big question: Are all these little improvements enough? Don’t get me wrong, I’m digging all the big numbers and heavy specs, but many of them are things I was hoping to see on the Galaxy Note 8, and just getting them now may be a little too late. This said, I won’t know for sure until I spend more time with the device, so check back soon for a full review of the Galaxy Note 9. The Note 9 will be available for pre-order starting August 10th, with in-store availability starting August 24th. Unfortunately, since Samsung is once again letting carrier set their own prices, we’re still waiting to see how much the Note 9 will actually cost across all the various networks. UPDATE 12pm EST: We now know the price of the Note 9, and yikes. At T-Mobile the 128GB model will start at $1,000, or $30 a month over 24 months, with $280 paid at the time of purchase. The 512GB model will retail for $1,250 or $30 a month over 24 months with $530 paid at the time of purchase. At Verizon you can pay $41.66 over 24 months for the 128GB model, and $52.08 over 24 months for the 512GB model. 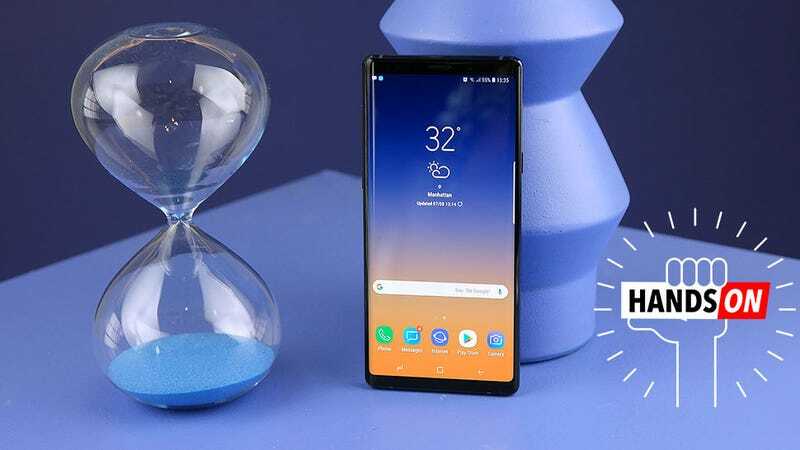 Sprint has a limited time offer for the 128GB Note 9 where it will be 50-percent off, or just $20.83 a month over 24 months. At AT&T the 128GB model will be $33.34 for 30 months, or $1,000 total.